A new exhibition gives an insight into the lifestyle of scholars of the Song and Ming dynasties and their four jewels – the inkstone, writing brush, ink and paper. Ancient Chinese lived an artistic and refined life, which included tea drinking, flower arrangement and, most importantly, the scholar’s four jewels — a writing brush, ink, an inkstone and paper. Many artifacts remain to give us an idea of how these scholars lived, created and worked, and some of these are on display in an exhibition at the Zhejiang Museum through October 21. The exhibition offers visitors a journey through how aesthetics evolved throughout a millennium. It is divided into two periods: The Song Dynasty (960-1279) and the Ming Dynasty (1368-1644). During the Song Dynasty, the four most regular activities for scholars were burning incense, tea ceremonies, ink-wash paintings and flower arrangement. It was a marked difference from the Tang Dynasty (AD 618-907) when people’s entertainment centered on equestrian sports and luxurious vessels made of gold and silver. Instead, the Song Dynasty turned to people’s inner emotions and a minimalist art style. Song people absorbed elements from Buddhism, Confucianism and Taoism and applied them to designs of gardens, furniture and vessels. They sublimated the sensual experience of tea, incense and flowers. They sought poetic meaning from ingredients and utensils. Song people preferred porcelain censors because they are light and odorless. The censor was used to burn incense composed of sandalwood in a study room. Goblets and cylinder-shape censors were common in the Northern Song Dynasty (960-1127), while versions imitating millennia-old bronze vessels were found favor in the Southern Song Dynasty (1127-1279). Another trend among scholars was drinking tea. Tea symbolized life style, character and cultural identity. The exhibition includes exquisite tea utensils of the wealthy Lu Family in present-day Shaanxi Province. More than 1,000 burial objects covering all aspects of life were unearthed from this family’s grave. Flower arrangement is popular with white-collar ladies today but in the Song Dynasty it was an activity for scholars, who believed it showed the arranger’s philosophy and morality. Common shapes of vases included meiping and antique styles modeled after vessels from the Shang (c. 16th century-11th century) and Han (206 BC-AD 220) dynasties. The imitations somehow reflected a trend of cultural renaissance and an admiration for traditional rituals. Common materials were copper, jade and bronze. Meiping is tall, with a narrow base spreading gracefully into a wide body, followed by a sharply rounded shoulder, a short and narrow neck, and a small opening. It is traditionally used to hold plum branches. The exhibition also highlights the scholar’s four jewels. An ideal inkstone should have an elegant shape and pattern, craftsmanship should be top-notch, and materials must be superb. In China, one of the best stones suitable for inkstones is the volcanic duan stone from today’s Zhaoqing in Guangdong Province. The displayed duan inkstone is engraved with eight characters written by Yue Fei, a well-loved military general in the Southern Song Dynasty. Yue used a saying from the “Analects of Confucius” to express his aspirations and ambitions. The Ming took on some aspects of the Song, but moved from political and social meanings of items to function and sensuality. 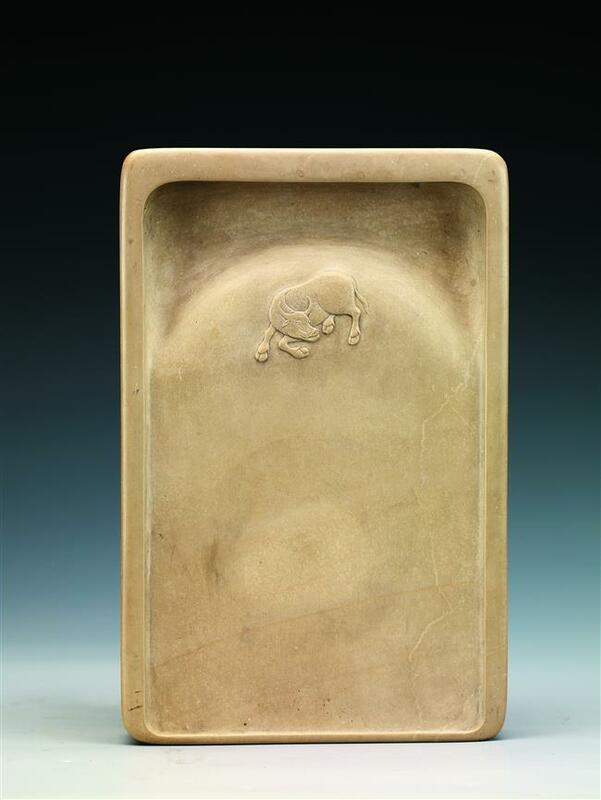 The highlight of the Ming Dynasty section of the exhibition is a white duan inkstone from Liu Rushi, one of the “Eight Beauties of Qinhuai” renowned in her time for her beauty and talent. Unlike the normal dark purple this one has a rare light color. Address: Zone E, West Lake Culture Plaza, 581 Zhongshan Rd N.